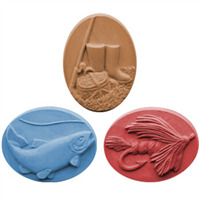 You’ll find fish and fowl in this beautifully detailed mold based on M.C. 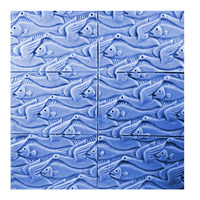 Escher’s famous “Bird/Fish (No. 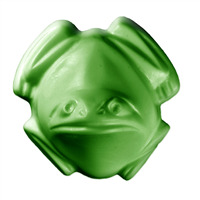 22)” tessellation. 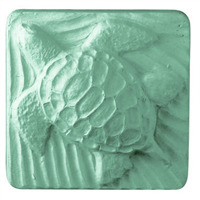 The graphic design elements on the Fins & Feathers Soap Mold Tray make it perfect for Op Art collectors and fans of geometry. 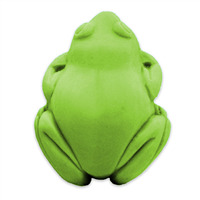 Bar Depth: 1.25" Bar Length: 2"
This funky frog is looking up as if he is waiting to be kissed by a princess to turn him into a prince! 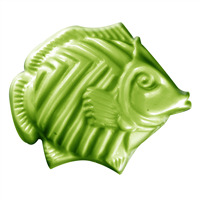 Bar Depth: 2" Bar Length: 3.5"
Goldfish in Feng Shui are seen to be creators of good luck and positive outcomes, so keeping fish or having soap with goldfish on it means that wealth is on the way. 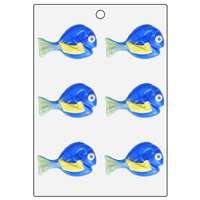 The One Fish Soap Mold depicts an angelfish with chevron stripes on its body, textured fins, and a face with a wide eye and a protruding mouth. 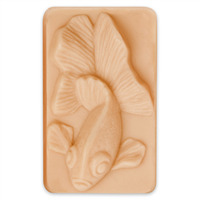 Make one-of-a-kind soaps with this little fishy! 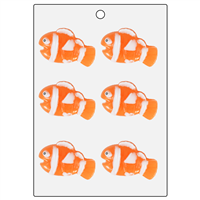 Bar Depth: 1 1/4" Bar Length: 3 7/8"
We're not clowning around when we say any fish-enthusiast will adore soap creations made with our Striped Clown Fish Mini Mold! 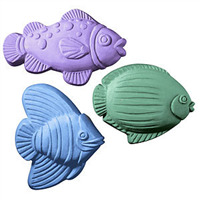 Embellish blue bars or embed into "fishbowl" soaps for fishy fun. 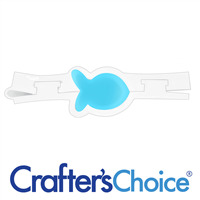 This little guy is doing his best to make his way across the beach to his home in the ocean. 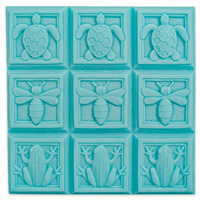 The Turtle Soap Mold is a great choice for beach homes, summer baskets and reptile lovers.